Sterling, IL, September 2018: Sterling Systems & Controls, Inc. is pleased to announce the availability of a new line of Semi-Automatic Hand Prompt Batching Stations with custom designed automation software to meet the specific requirements of each customer. The Hand Prompt Batching Station serves a wide range of industrial applications where the negative effects of time consuming and problematic manual batching needs to be eliminated. The Hand Prompt Batching Station is a semi-automatic batching system that requires operator involvement through each step of the batching process, but provides customized automated operator instructions or “prompting”, ingredient lot tracking and batch validation, automatic weighing with over/under tolerance control, etc. This system will eliminate bad batches that result from operator error and interruption. The operator no longer needs to keep track of where he is in the batching process as the automated Hand Prompt Batching Station does that for him automatically. No missed ingredients! No bad batches! 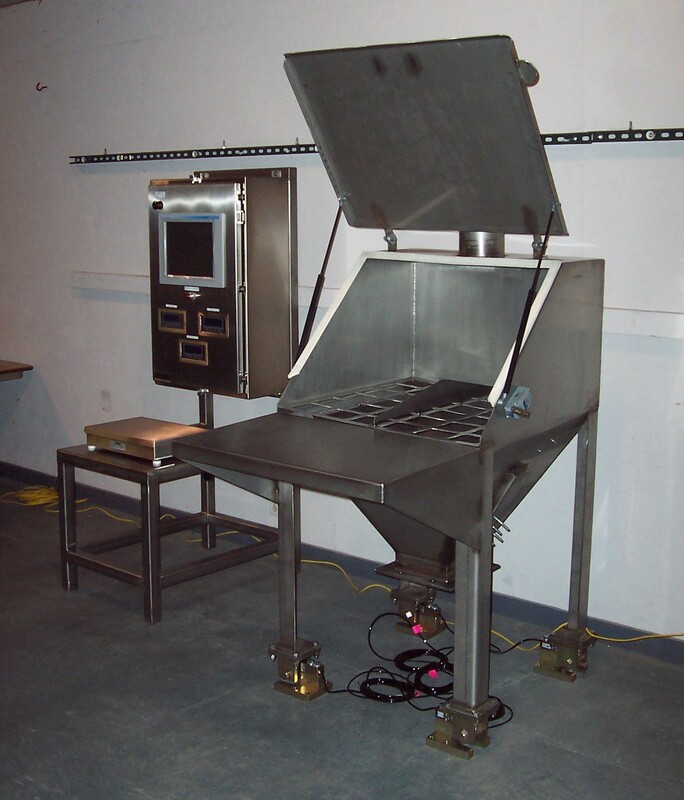 The Hand Prompt Station can be combined with bench, floor and even our bag dump scales. The Hand Prompt Batching Stations’ PC will ask the operator to weigh ingredients. The Sterling Systems & Controls’ Hand Prompt Controller will sequence an operator through a formula one ingredient at a time. The primary advantage of the system is to ensure that each ingredient added to the batch container is within a programmed weight tolerance, and from the correct ingredient lot (using barcode scanning or manual entry) before the controller will index to the next ingredient to be added. This will ensure the validity of all of the batches that are created by the operator. The Sterling Systems & Controls’ Hand Prompt Batching Station provides real time records for each batch produced. This enables the highest standards to be maintained by ensuring a consistent batched product. As batches are produced, the batching controller records the batch data and can print batch reports to a ticket printer. Additional reports and data can be printed on a standard network printer (batching station will need to be connected to your network) if one is available. The printout provides a hard copy of each ingredient by identification along with the required and actual formula weights. A time and date is also stamped on each report at the start and end of the batch. More information on the new Semi-Automatic Hand Prompt Batching Station is available from Sterling Systems. With more than forty-five (45) years of experience providing efficient solutions for process equipment, batching, micro, minor and bulk weighing, bag unloading systems, bag loading, bag dumping, as well as plant automation, Sterling Systems & Controls, Inc.’ designs utilize the latest technology to provide specialized data management, raw material management, along with production data tracking. For more information contact Sterling Systems & Controls at 1-815-625-0852 sci@sterlingcontrols.com, and at www.sterlingcontrols.com.